If the demo video is detected (Help > Get help > Detect your first video) but you encounter some problems detecting Youtube videos, see the YouTube workaround below. If the demo video is not detected, see this post for solutions. 2. Copy and Paste youtube video's URL and click on Donwnload. The download starts immediately! Hello, I can detect « My first video », but so far, I cannot download any other Youtube video. I have downloaded other videos, from other sites, without problem. My version is VSO Downloader Ultimate 3.2.0.6 registered. Is my issue still related to Youtube changing the protocol? If so, Why can I download « My first video »? When I check the network config, I get the jMicron adapter Online, but Microsoft not Online. May it be related? Thanks a lot for your help and guidance. I have the same trouble also. I have stooped my anti-virus program and turned off my firewall, still no detection on YouTube using chrome. However it works using firefox, what am I missing. Cannot download from youtube channel The Thunderbolts Project. I have deleted cache/cookies using ccleaner which previously fixed the issue. The youtube link starts with https. I have previously downloaded from this youtube channel. please provide an URL to reproduce the problem. No problem at all with detecting and downloading that file. Remember to change https to http and log out from Youtube account first. This is a nice trick. 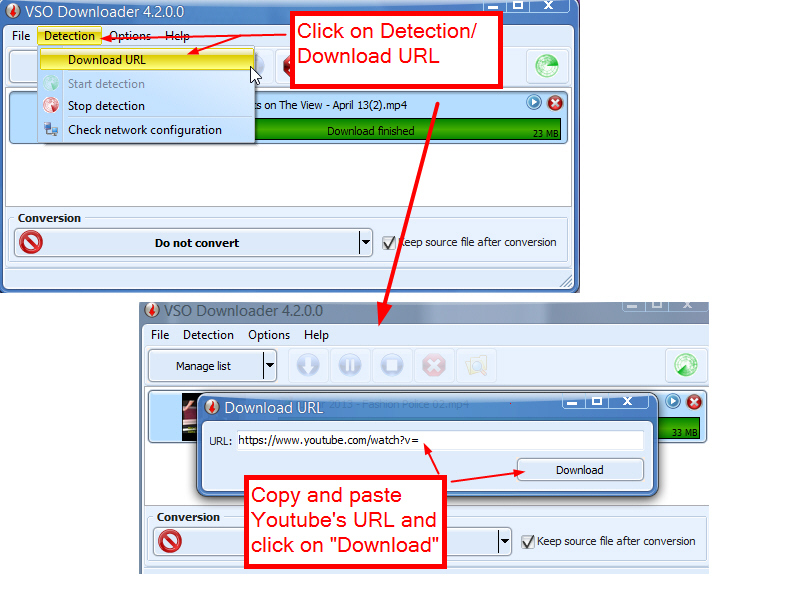 The Downloader would not download some videos on Youtube until I tried this trick. Logging out of Youtube, taking the "s" out kicked the Downloader in gear and has worked so far for every youtube vid I've thrown at it that I could not previously download before. Very nice, glad I read this thread. Is VSO Downloader going to support YouTube downloading with http*s* ? As it's a PITA logging out, deleting the *s* in the video URL, downloading a video, then logging in to comment, then logging out to download etc. for now this is not possible. Steel Toecap wrote: Is VSO Downloader going to support YouTube downloading with http*s* ? It is not so simple and might even be illegal in most European countries to break https protection to be able to download from https page. I have another that does https be default, although I'd prefer to do most video downloading with just the one tool. I am annoyed at the protocol involved in trying to download YouTube videos. I know you aren't interested in other software but I am able to enter the url and download from YT every time using the simplest free program, "FreeRapid Downloader", https or no s.
fully supported with latest version (4.0.0.19), be sure to log out from your youtube/google account otherwise you will always be redirected to https. Are you still being redirected to https page instead of http? Have the same problem can't download anything from youtube i get allways redirected back to https. Benjamin wrote: fully supported with latest version (4.0.0.19), be sure to log out from your youtube/google account otherwise you will always be redirected to https. Have logged out from YouTube / Google has also cleared the cache and reboot the computer, checked that I am logged out from Google / YouTube.